Welcome to Married Life: Water Slides! 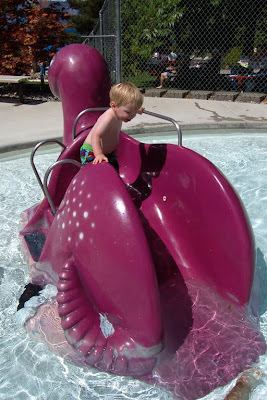 These pictures of us at the water slides today are courtesy of my mom, Nana, as she is trying to get Cory to call her. We bought passes this year so hopefully Cory will get more and more comfortable and really enjoy it. Not the he didn't today, on no! 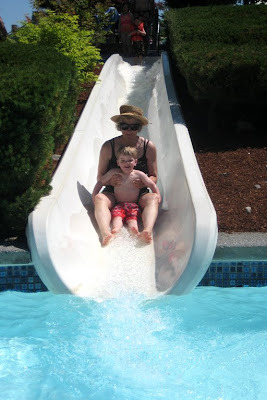 My mom doesn't slide as fast as I do (ask my camp friends how fast I go on water slides and how I got my nickname...) so she got the honors of taking Cory down the "big" slide for most of the time. But really all he wanted to do was play in the water and they have a fantastic kiddie pool complete with water toys. 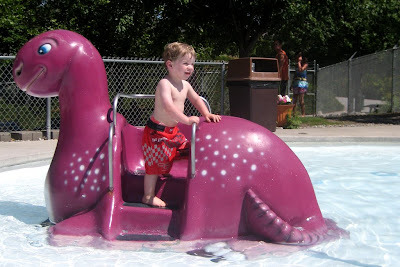 Oh, and this was last summer at the water slides... oh my, where is my baby gone to? oh wow, a dino slide! my son would be in heaven! It looks like your little guy was enjoying himself! Those slides look like a lot of fun, even for adults. I am impressed that your mom would go down the slide. Go Grandma! That is one awesome Nana! Love those pics. I want a go on that dino slide, it looks so fun. I would like to invite you to take part in my post on tuesday, it's called tell a joke Tuesday. so if you know any jokes then feel free to join in. Looks like a great place to cool off. Love the dino slide. :) Adorable! I bet he had a fantastic time! fun day! Here’s my photo story happy Friday!